In the late 90's I moved to New York City, ostensibly to "be an artist" or to try and put my art degree to good use, anyway. I ended up in a crooked apartment above a Chinese restaurant in Brooklyn, and got a job at Pearl Paint on Canal Street selling art supplies and paints on the 2nd floor. Day in and day out, all sorts of interesting people would stream in to buy things as simple as a pencil or a small tube of watercolor paint. I was working a register one day when I rang up an unassuming guy who later came back up to the counter, handed me a card and asked if he could take my picture. I really wanted to be the dead guy on the floor. As weird as that could have ended up being, it was the start of a friendship with the very talented photographer Ethan Hill. You can see his current portfolio on his website. Ethan later invited me to be in a photo shoot he was doing with Tom Fontana, the creator of a popular television series called "Oz" for Entertainment Weekly's "Best of 1998" issue. I took a cab downtown on a rainy afternoon to an unmarked door where a guy was standing in the rain trying to get in. 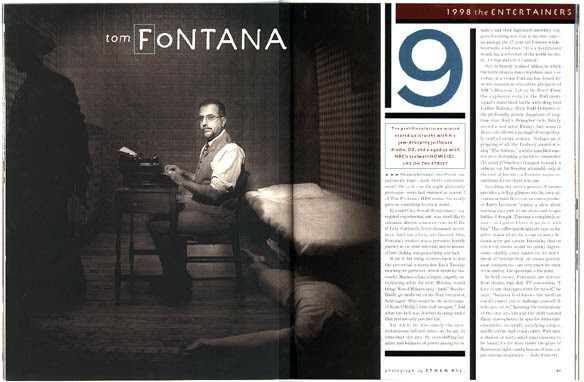 Turns out that guy was Tom Fontana himself. Inside was a gargantuan loft with a small room built in the middle of it (the "walls" you see in the picture were flimsy and hanging from the ceiling), tables full of catered food, and make-up and prop people walking around everywhere. I lobbied to be the dead guy on the floor, but ended up being the gangster. Even though I didn't end up being much more than a silhouette on the left, people spent a lot of time making sure the suit and hat fit correctly (lots of pins and tape). If I recall correctly, there was also a person there specifically for the prop gun, because it wasn't just a plastic thing–it had heft like a real gun. I was hoping that would lead to more photo shoot work, but alas, this was probably the last time I'd ever be in a national magazine. It was a great experience anyway–as was the entirety of the time I spent in NYC. I haven't seen Ethan in years, but I know he's doing well, and I still fondly remember that rainy afternoon in a large downtown loft wearing a sharp suit, eating bagels, and slinking away from the scene of the crime.